I grew up thinking that I hated zucchini. My husband felt the same way and I think we bonded over this. Us against zucchini was one of our rallying cry! And then three years ago, we joined a CSA. And with a CSA comes zucchini. Lots and lots of zucchini and summer squash of all stripes and shapes and colours. Sure, giving it away seemed like a plausible option but when you are paying a dear sum upfront to receive a share of local, organic vegetables every week for nearly 6 months of the year, giving away so much of what we’ve paid for didn’t make fiscal sense. And because I’m thrifty, I decided that I’d keep the zucchini and summer squash and learn to like it. Tentatively, I started sneaking it into meatloaf, tucking them into a roasted pasta bake, and hiding them under cheese. Hmph, not so bad! Unexpectedly, I started giving them a shining role in our meals and I actually started to welcome them into my food. Cornelius still says he hates zucchini, even when happily munching on a meal full of summer squash, but I think he just doesn’t want to lose face. Last summer I made this dish, minus the brown rice and we both loved it and ever since then, it’s become a summer staple. Without the rice, it’s more of a side dish. With the rice, it seems a bit more main dish worthy and it’s surprisingly flavourful considering it has fairly humble origins. 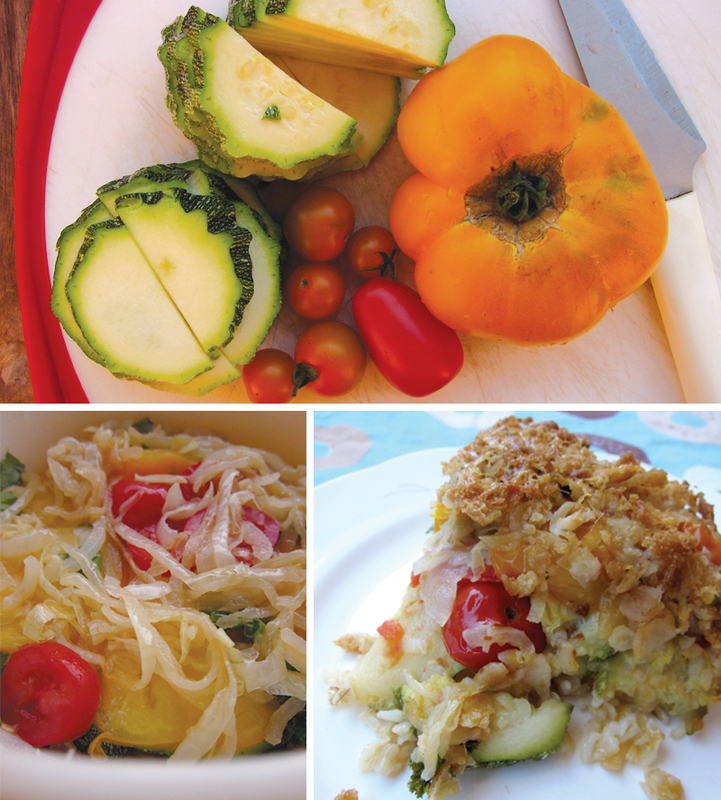 Onions caramelized until sweet and fragrant, juicy heirloom tomatoes and that much-aligned zucchini. There’s parmesan cheese and some crushed crackers too, along with some fresh-off-the-balcony basil to give this meal a bit of oomph. As you can see, I’ve used whatever tomatoes I could scrounge up – giant heirloom varieties, plum and sun golds. It works. In the recipe, I write to cut your zucchini into coins. For me it’s totally psychological to cut them again in half. I’m sure you’re not as crazy as I am and will eat your zucchini in rounds. Whatever gets me to eat the zucchini, amirite?? As for the type of pan to use, I think an shallow baking dish works better than the casserole dish I used above. Deeper dish equals longer cooking time. I’ve used an 8×8 pan with great results. elsewhere: Head on over to Poppytalk for a great weeknight vegetarian meal – spaghetti with seasonal vegetables. We make this meal often and can vouch for it’s simplicity & deliciousness. Cook brown rice according to package instructions. Meanwhile, add oil to a large skillet and over medium heat, cook the onions, stirring occasionally until soft, fragrant and caramelized and quickly stir in the garlic. Rub a bit of additional oil along the bottom and sides of a shallow baking dish. Layer all the rice along the bottom. Add a layer of caramelized onion, followed by a layer of zucchini and a layer of tomato. Sprinkle with a touch of salt and pepper, half the basil, and half the parmesan cheese. Repeat. In a bowl, combine the topping ingredients and crumble over top of the dish. Drizzle with additional oil if desired. Bake for 35-45 minutes or until golden brown. I’ve become familiar with this since we joined a CSA. We had loads of yellow summer squash, though. This looks like a creative and healthy staple! Mmmm, that looks good! I don’t mind zucchini, but my kids hate it passionately. Caramelized onions, though… those I adore! NicoleD, it sure is 🙂 I’m quite surprised at how lovely all these ingredients work together. I love the sound of this one. Anything with veggies and the right flavor thrown into a pie form. That’s what I love about summer and all its abundance; roasting veggies, baking veggies with the right amount of spice(s) is tres fab. You know I feel the same way about peanut butter? I’ve ‘hated’ it for so long that now, even when I bite into something peanut buttery and delicious I still act like I hate it. Now zucchini, I can do! What is it about Zucchini (or we call it Courgette!) that you hate? Theresa professes the same hatred, but it’s just kind of bland and waiting to take on some flavor, no? Texture? This looks a great use for what is pretty much one of the only things we can grow well here! I usually griddle them on a heavy pan and put them in salad – again, though, they end up on the side of Theresa’s plate to my frustration; maybe I can sneak them in like this?? Oh, I love zucchini, eggplant, cucumbers and tomatoes 😉 Nobody needs to fancify these veggies in order to get me to eat them. But a little olive oil and salt goes a along way. This Tian you’ve made looks so luscious! Can I use the word “luscious” to describe something that is not a dessert? 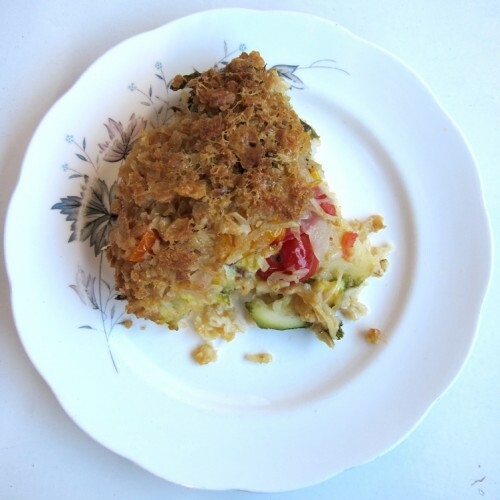 Anyway, I love that you’ve added some extras to take this zucchini based dish to a whole other level like adding the breadcrumbs and the parmesan cheese! A little off topic but since you mention basil…. do you have problems with little white bugs (aphids?) on your basil leaves? And if so, how do you take care of them? The detergent/water spray is not helping mine. Ha!!! I knew it, Kasey! It’s that stubborn-ness to letting go, I think! Joanne, give it a try – he might like it….maybe if you serve lots of wine alongside & some great crusty bread? A perfect conversion dinner, I think! Adam, I think it was the texture – I’m new to liking cucumbers too! Hopefully Theresa gives this one a try and likes it. I used to hate most veg & fruit, but I’ve come around. Bijoux, I’m still working on eggplant – and I think if you wanted you could certainly add some thin slices here to this as well. I’m going to work on my eggplant hatred and come around soon (late bloomer I am!). ytg, my basil has been doing so well this year – no aphids. Last year, I had the bugs like crazy and I also found that the dish soap + water spray didn’t really help. Sorry, I have no ideas, but good luck – I hope you find a solution. Thanks Cecilia, it’s a keeper for sure. Amanda that is genius! I put cucumber in mine (and a recipe is forthcoming), but I love that trick! Rad. This sounds like a really fresh recipe, and I cant wait to try it out. I think I will make for my family. This is pretty much the best. You’re welcome. This sounds rather nice! I’m definitely going to try it out with my mother. I totally love this dish! It’s healthy and cozy all at once, which is exactly what I aspire to in fall cooking. And even though I’ve always loved zucchini, I totally get where you’re coming from – it’s easy to fatigue on it at the end of the season. Molly, thanks for spreading the zuke love! I’ll give your recipe a try, thanks. Kara, this is perfect family fare, enjoy. Thanks Megan, that looks amazing. 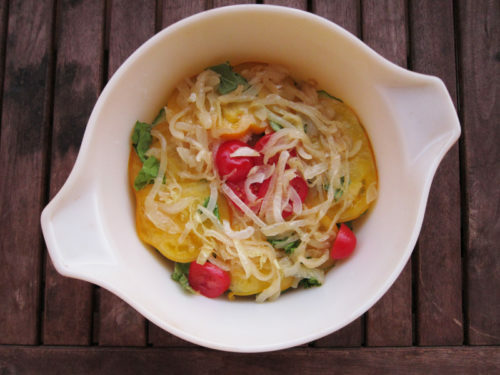 Kimberly, it is healthy and cozy so it works so well for into-fall cooking. I made this tonight and really enjoyed it. I needed a 13″ oval X 1.5″ high baking dish to hold the uncooked veggies. Next time, I’ll use a cup of brown rice, the rice adds a nice bite and a good contrast to the veggies. I think I was too conservative on the basil, I probably used ten leaves and don’t think 20 would have been overpowering. The crouton topping was excellent and I’ll be using that for other dishes. Another winner from Ms. Pleat. So glad to hear, Robert. It’s such a favorite of mine so I’m glad that you liked it too. 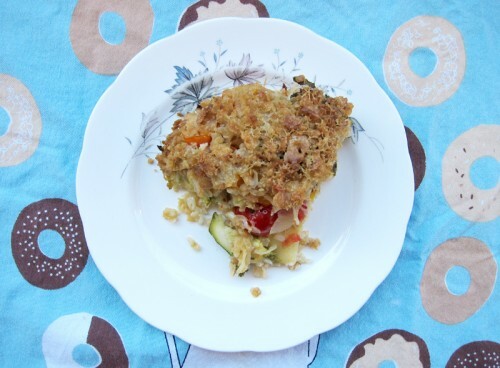 And yes, that crumble topping is a win! Good for you for learning to love zucchini! I was getting so tired of it. Though I’d rather have zucchini than 3 cucumbers haha. I love what you came up with for the zucchinis though, especially the parmesan cheese cracker topping! Awesome awesome recipe. I think the rice is essential. I had far less tomatoes than I thought, so I added some really finely-sliced red pepper and it was great. I also added some parsley since I had some in the fridge. I would do the same again. Yum.